Among participants of the Tactical Leadership Programme (TLP) 2013-2 flying course held at Albacete AB in Spain between March 4 and 27, 2013 were three Sily Powietrzne Rzeczypospolitej Polskiej (Polish Air Force) Mikoyan MiG-29A Fulcrum-As. 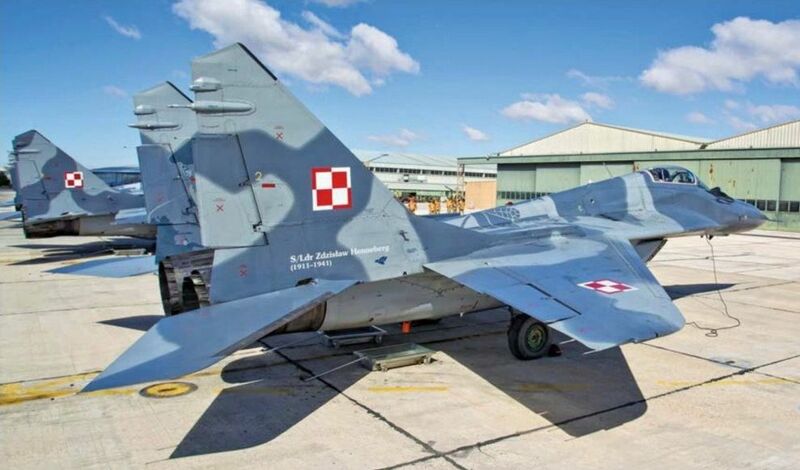 Three aircraft (59, c/n 2960532359; 111, c/n 2960535111; and 114, c/n 2960534114) were deployed for the course by 1 Eskadra Lotnictwa Taktycznego (1 Tactical Air Squadron) from Minsk-Mazowiecki. MiG-29A 59 is seen on the apron at Albacete awaiting its next mission. The aircraft is dedicated to 'ace' Squadron Leader Zdzistaw Henneberg, who fought the Luftwaffe with the Polish, French and Royal Air Force between 1939 and his death in April 1941. His name is carried on the Fulcrum's starboard fin. At the conclusion of TLP 2013-2, a total of 24 pilots from Belgium, France, Italy, Greece, the Netherlands, Poland and the United States received graduation diplomas. Royal Malaysian Air Force Sukhoi Su-30MKM Flanker M52-14 was displayed at the Langkawi International Maritime & Aerospace Exhibition 2013 (LIMA '13) held at Langkawi in Malaysia between March 26 and 30, 2013. The aircraft is one of 18 that entered service from July 2007 and is operated by Skuadron 11 based at Gong Kedak AB. Seen at Yeovil, Somerset, recently was VVIP AgustaWestland AW101-640 HMH-1 (c/n 50239, ex ZR334). The helicopter is one of two ordered in early 2008 for the Saudi Royal Flight and made its maiden flight on July 27, 2010. The second (HMH-2, c/n 50240, ex ZR335) was flying by mid-July the following year. Departing RAF Mildenhall, Suffolk, on March 31, 2013 as TROUT 99 is Boeing KC-135R Stratotanker 63-7980, the fourth Speckled Trout, a codename also applied to its operating unit. During March it completed a periodic depot maintenance, during which it exchanged a grey scheme for these colours. 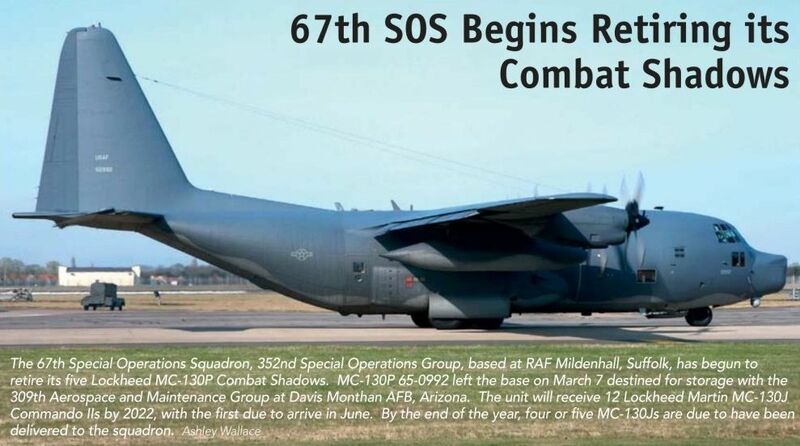 The aircraft is assigned to the 412th Flight Test Squadron based at Edwards AFB, California, and is used as required for transport by the Chairman of the Joint Chiefs of Staff, Secretary of the Air Force and the Chief of Staff of the Air Force, as well as a trials platform. The aircraft has non-standard equipment for communications and threat warning. The first full operational capable (FOC) NHIndustries NH90 NFH (Naval Frigate Helicopter) for the Netherlands, N234 (c/n 1234/NNLN10), was noted at Naval Air Station (NAS) De Kooy on March 14, 2013. It was delivered to the Dutch Defence Helicopter Command's No.860 Squadron on January 30. Twenty NH90 NFHs are on order for the Dutch armed forces along with 14 naval mission systems suites. No.860 Squadron at NAS De Kooy will receive 12 NFHs. They will be used for shore-based search and rescue, single helicopter ship-based operations as well as sea-based operations from landing platform deck or joint support ship class naval vessels. All seven interim meaningful operational capable (MOC) NFHs, which were delivered to No.860 Squadron from 2010, will be refurbished by AgustaWestland, which produces the Dutch NH90s, to bring them up to FOC standard. Gilze-Rijen AB will house eight transport NFHs, which will equip No.300 Squadron for land-based operations. Mikoyan MiG-29SMT Fulcrum '22' red/RF-92934 takes off from Petrozavodsk (Besovets) air base during Ladoga-2013. The aircraft was deployed there for the exercise from its home base at Kursk. 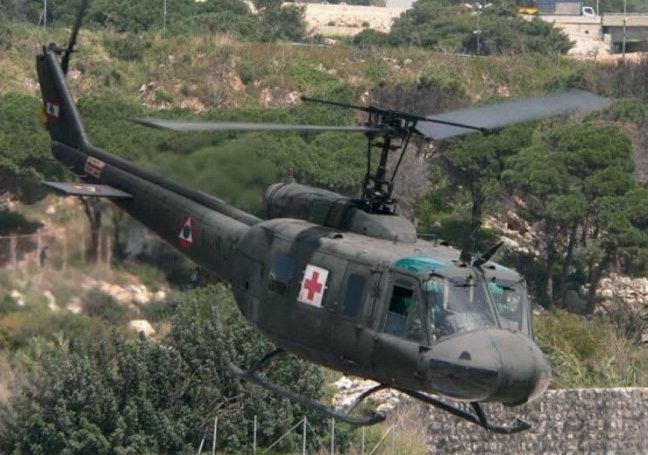 Lebanese Air Force Bell UH-1H Huey L1009 of the 10th Squadron, based at Beirut and using the callsign Black 2, lifts off from the beachside car park for a casualty evacuation mission during Exercise Cedre Bleu. Sikorsky CH-53D Sea Stallion BuNo 157176 stored at Tel Nof, where it will be used as a spares source for the active Israeli Yasur fleet. No. 17(R) Squadron disbanded at RAF Coningsby, Lincolnshire, on April 17, 2013. The operational evaluation unit painted Typhoon FGR4 ZJ947 in special marking for a small ceremony held at the base for the occasion. The unit's role of evaluating and developing tactics for the Typhoon has passed to No.41(R) Squadron, the Fast Jet Operational Evaluation Unit. No. 17 Squadron is destined to reform as the Lockheed Martin F-35 Lightning II evaluation unit; it will initially be based at Edwards AFB in California, before returning to the UK at RAF Marham, Norfolk. 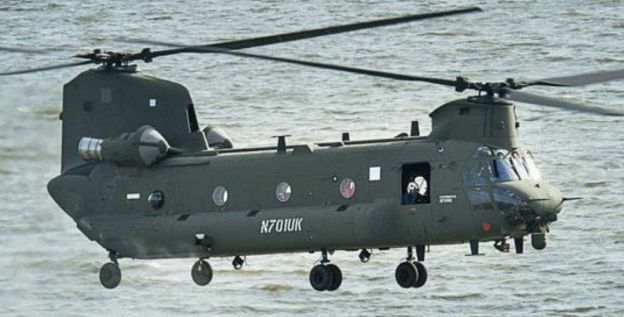 Boeing announced on April 15, 2013 that the first Chinook Mk 6 for the RAF had flown. 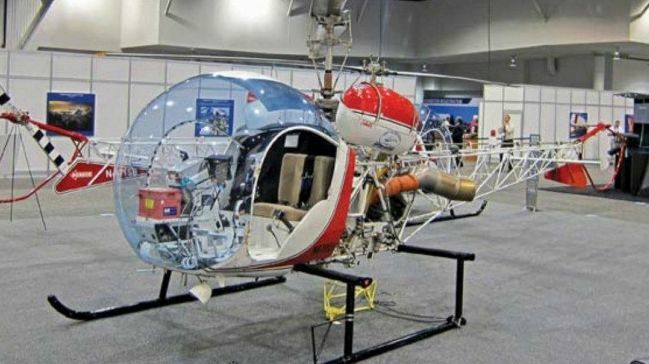 The helicopter (N701UK, c/n M7701) was built at the company's Ridley Township facility near Philadelphia, Pennsylvania, and has undergone test flying at Mesa in Arizona with first flight on March 15. The RAF has 14 Chinook Mk 6s on order, a version of the CH-47F with British-specified equipment. The first is due to be delivered later this year. The Nigerian Air Force is operating Dassault-Breguet/Dornier Alpha Jet Ns from Niamey in Niger to support the African-led International Support Mission to Mali (AFISMA). Two aircraft and four pilots from the 99 Air Combat Training Group were initially deployed to Niger, leaving Nnamdi Azikiwe International Airport, Abuja, on January 18, 2013. Two more aircraft were due to join them at a later date. Alpha Jet N 78453 (seen here) and 78455 was noted at Niamey on April 4. Niamey also hosts a Nigerian Mil Mi-35 deployment as part of its AFISMA operations. The airline Orbest Portugal has been transferred to Barcelo, a tourism company based in Palma de Mallorca, following the end of operations by Orizonia and the sale of most of its divisions. Orbest Portugal plans to have three aircraft in service for the summer season, including Airbus A330-343X CS-TRH (msn 833) for long haul flights and two A320-214 (CS-TRK, msn 4735, ex EC-LLX, pictured, and CS-TRL msn 3758, ex EC-KYZ), which will be transferred from the former Orbest Orizonia (Orizonia's former Spanish airline, which has closed), for short- and medium-haul flights. Airbus A320-214 VQ-BDJ (msn 2187, ex N269AV) of Ural Air has had 'Ekaterinburg World Expo 2020 Candidate City' stickers applied to the rear fuselage to support the Russian city's application to host the event The airliner is seen at Cologne Bonn Airport in Germany on March 13, 2013. Ural Air is not the only airline supporting a bid to hold the exposition, as Emirates has applied stickers to its fleet of Airbus A380-861s to promote Dubai's submission. Airbus A320-214 EI-DEO (msn 2486, ex F-WWIV) completed the types' first service with Virgin Atlantic Airways on March 31, 2013, flying between Manchester and London-Heathrow airports. The airliner arrived on delivery from Dublin, Ireland, the previous evening. 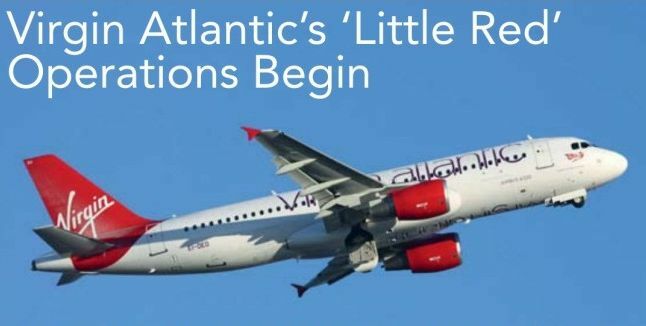 Virgin Atlantic has leased four A320s from Aer Lingus to undertake domestic UK services - a first for the carrier - which previously concentrated on long-haul flights. The new routes have been branded 'Little Red' by the airline. Boeing 787-8 SP-LRC (c/n 35940) had the registration N1791B applied for battery test flights. The airliner is wearing the temporary identity at Paine Field/Snohomish County Airport, Washington, on March 16, 2013, prior to the start of the test flights. Short Tucano T1 ZF269/'RA-F' of No.72(R) Squadron based at RAF Linton-on-Ouse, South Yorkshire, is the 2013 display aircraft. It has been painted in a desert camouflage design to represent that applied to the squadron's Spitfires in North Africa and Malta in 1943. Noted at Niamey-Diori Hamani International Airport in Niger on April 4, 2013 was de Havilland Canada DHC-8-102 Dash 8 5Y-BVO (c/n 007, ex TR-LGX) operated for the United Nations Humanitarian Air Services for the World Food Programme. It is owned by Aircraft Leasing Services, based at Nairobi-Wilson Airport in Kenya, one of four operated by the company for the UN. The first Eclipse EA-550 very light jet rolled out of the production facility at Albuquerque International Sunport, New Mexico, on March 18, 2013. Bell 47G-2 N67021 (s/n 3000) is registered to Scott's Helicopter Services based at Le Seur, Minnesota. 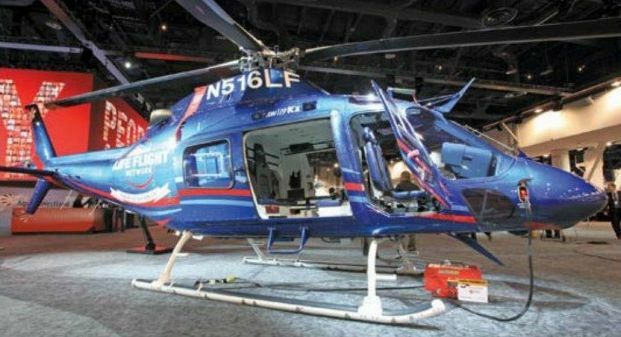 The helicopter displayed on SB47's stand at Heli-Expo had an RR300 installed to promote the engine as a retrofit for existing Bell 47s. 26 марта 2013г. корпорация Kawasaki Heavy Industries на своем предприятии в Гифу передала Морским силам самообороны Японии первые два новых противолодочных патрульных самолета P-1. 29 марта они перелетели к месту базирования 51-го авиационного крыла 4-й авиационной группы на авиабазе Ацуги, где будут проходить программу обширных испытаний и использоваться для подготовки личного состава. В общей сложности планируется закупить 70 P-1. 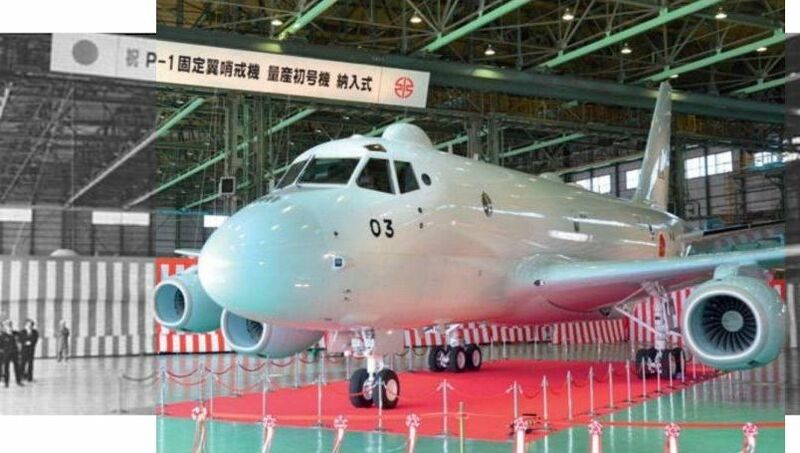 Kawasaki Heavy Industries P-1 5503 was one of two maritime patrol aircraft handed over at Kakamigahara on March 26, 2013. 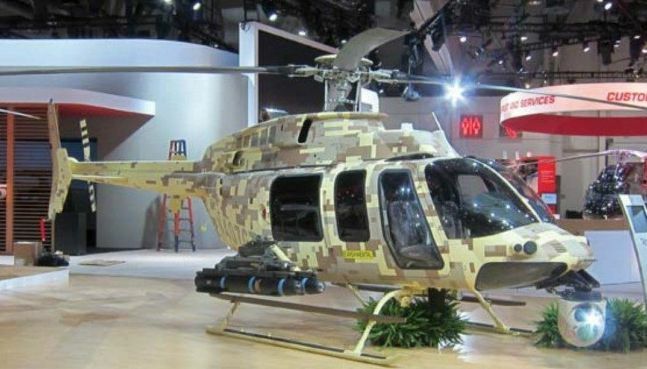 Eurocopter is renowned for launching new models at major trade shows and Heli-Expo was no exception. 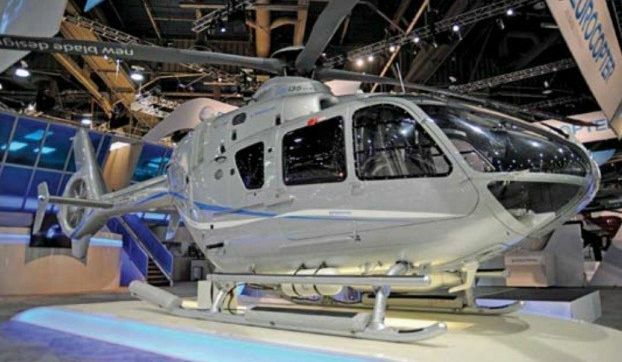 The Marignane-based company chose the event to unveil the EC135P3/T3, which features a number of improvements over the version currently in production. This latest variant of the light twin helicopter features optimised software for the FAD EC (full authority digital engine control) system, 100mm (4in) longer rotor blades and enhanced air intakes compatible with inlet barrier filters. The combined effect of the improvements provides a 30kg (66 lb) increase in the maximum take-off weight to 2,980kg (6,570 lb) and better performance in hot-and-high environments. The EC135T3 also features auxiliary fuel tanks and a new interior design. In late March and early April 2013 Learjet 25B N102VS (c/n 25B-180) was noted flying from MoD Boscombe Down, Wiltshire. The aircraft is operated by Calspan Corp of Buffalo, New York, and has been modified as an in-flight simulator equipped with variable stability via a programmable fly-by-wire system, so that it can replicate the handling of other aircraft types. It is regularly used by the US Naval Test Pilots School based at NAS Patuxent River, Maryland and was at Boscombe Down to support the latest course run by the Empire Test Pilots' School. 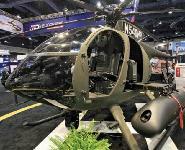 Bell Helicopters displayed its new 407GT - an armed version of the 407GX - at this year's Heli-Expo in Las Vegas. 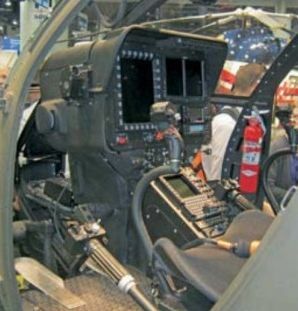 The GT version is equipped with a Garmin 1000H flight deck with a night vision-compatible instrument panel featuring twin 10.4 x 8in (264 x 203 mm) high-resolution LCD screens, an electro-optical/infrared imaging and designating turret (options are the L3 Wescam MX-15DI or the FLIR Systems 230-HD), a tactical radio suite and a weapons management system. The 407GT can also carry a selection of weapons on Mace Aviation's Extended Range Weapons Wings: up to four AGM-114 Hellfire air-to-ground missiles; or four 2.75in (70mm) advanced precision kill weapons system (APKWS) laser-guided rockets; or M260 seven-tube 2.75in rocket launchers. The helicopter can also carry two of three types of cannon: the Dillon M13D mini-gun, General Dynamics GAU-19/B 0.50 calibre machine-gun or the HMP-400 machine-gun pod. Bell quotes a list price of $2.9 million (excluding weapons and surveillance equipment) for the 407GT. The first production series example is expected to be available in the second half of 2013. MD Helicopter's MD 540F demonstrator aircraft (N540HH) on the company's stand in the Las Vegas Convention Center during this year's Heli-Expo. 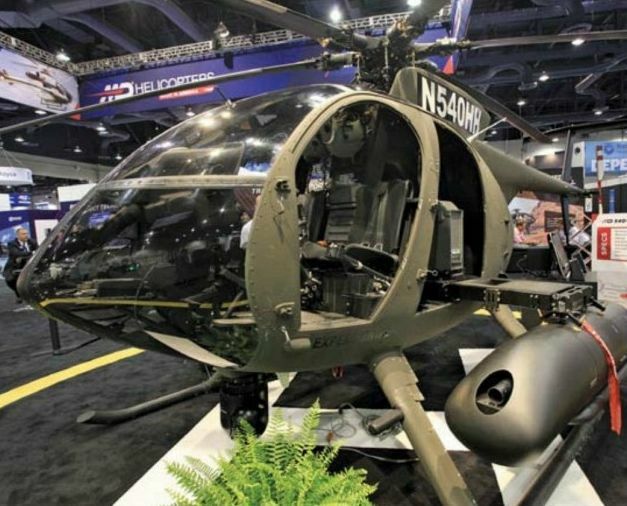 The company is offering the helicopter to the US Army for AAS. 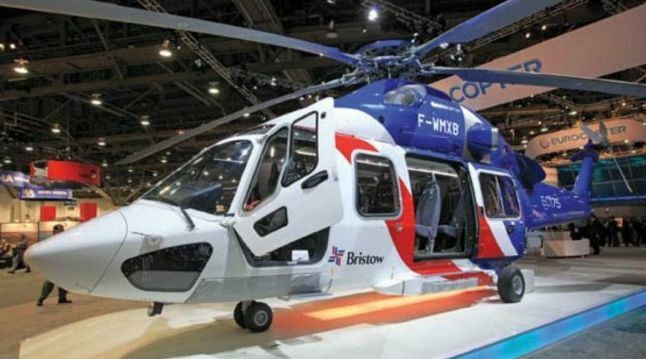 The first series-production EC175, c/n S01, at Heli-Expo 2013 wearing Bristow company colours and logos. Boeing P-8A Poseidon BuNo 168435 soon after its arrival at Boeing Field/King County International Airport, Washington. It is the next example of the aircraft due to be delivered to the US Navy. Federal Express McDonnell Douglas MD-11F N585FE arrived at Lester B Pearson International Airport at Toronto, Ontario, on March 25, 2013, carrying the Giant Pandas Er Shun and Da Mao. The mammals will spend five years on loan from the People's Republic of China to Toronto Zoo, before moving to Calgary Zoo for a further five years. The freighter arrived in Toronto from Chengdu Shuangliu International Airport via Vancouver after almost 15 hours in the air. FedEx is the official transport services provider for China's pandas and the Canadian flight was the sixth time it has flown the creatures since November 2000. The in-flight menu for the animals included up to 100kg (220 lb) of bamboo, 150kg (331 lb) of bamboo shoots, 50kg (110 lb) of apples and 15kg (33 lb) of fresh water. For the flight the aircraft, dubbed the 'Panda Express', was adorned with large decals of the animal on each side of the forward fuselage. Noted at Niamey-Diori Hamani International Airport in Niger on April 4, 2013 was Fairchild Swearingen SA227-TT Merlin IIIC N480WS (c/n TT-480, ex N81WS). The aircraft, equipped with an electro-optical turret under the centre fuselage, is devoid of ownership markings. It is registered to Worldwide Aircraft Services Inc of Springfield, Missouri, a service centre specialising in commuter turboprop aircraft, including the Merlin/Metro. It is however operated by the US Department of Homeland Security and understood to be involved in monitoring operations over Mali - possibly supporting the Nigerian Air Force's detachment, also based at Niamey. Three of the six Korea Aerospace Industries (KAI) KT-1B Woong-Bees of the Indonesian Air Force's Blue Jupiter aerobatic team lift off from Langkawi at the start of their routine. Two Boeing E-7A (737-7ES) Wedgetails of No.2 Squadron of the Royal Australian Air Force participated in Red Flag 13-3 at Nellis AFB, Nevada, which was held between February 25 and March 15, 2013. It marked the first appearance of the type at this series of exercises. No.2 Squadron operates six E-7As from RAAF Base Williamtown, New South Wales, with a permanent detachment at RAAF Base Tindal, Northern Territory. 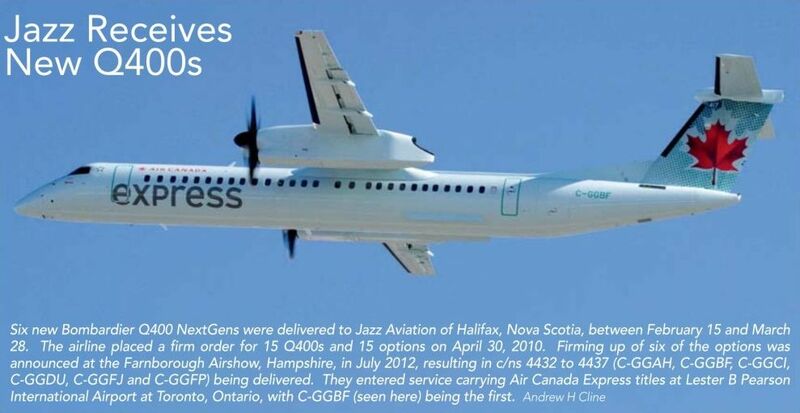 Six new Bombardier Q400 NextGens were delivered to Jazz Aviation of Halifax, Nova Scotia, between February 15 and March 28, 2013. The airline placed a firm order for 15 Q400s and 15 options on April 30, 2010. Firming up of six of the options was announced at the Farnborough Airshow, Hampshire, in July 2012, resulting in c/ns 4432 to 4437 (C-GGAH, C-GGBF, C-GGCI, C-GGDU, C-GGFJ and C-GGFP) being delivered. They entered service carrying Air Canada Express titles at Lester B Pearson International Airport at Toronto, Ontario, with C-GGBF (seen here) being the first. 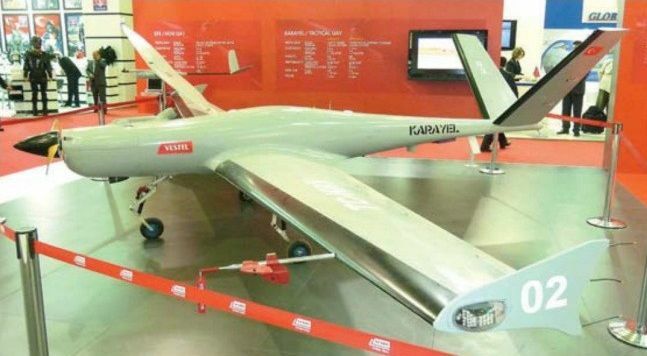 Deliveries of the Vestel Savunma Karayel to Turkey are due to start in 2013.